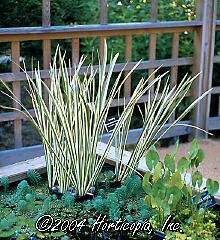 Perennial grass with green and creamy white striped leaves grow in fan shaped clumps. Plant in masses beside ponds or along streams as accent or groundcover. Feed through the season with complete fertilizer.